So Tiger, Jack, Kenny Perry and Stewart Cink, all played together in the Memorial Skins Challenge this afternoon, and not only did Tiger take home the lion’s share of cash, but he also did so in a way only he could. There were four skins that had carried over to the 18th, and Tiger hit a clutch putt to deny Kenny Perry the win. With five skins now carrying over, the four players decided to have a closest to the pin contest from off the 18th green, and Tiger decided to show off by holing his chip…. Just crazy! I mean, the fact that someone could even suggest that another human being might even approach MJ’s level of competitiveness is preposterous! That chip-in is crazy too. Is it possible Tiger won’t be the best ever? 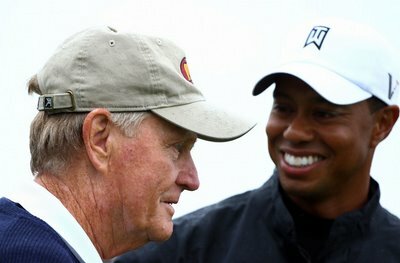 Stupid article by Rick Reilly - Is it possible Tiger won’t be the best ever?